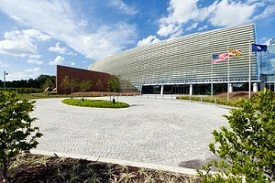 The next S-RIP workshop and the SPARC Data Assimilation (DA) workshop will be held at NOAA Center for Weather and Climate Prediction (NCWCP), Maryland, USA. Registration is requested for both the DA and S-RIP workshops. In Subject, enter either "SPARC DA Registration" or "SPARC S-RIP Registration"
Group rates have been arranged at the following hotels. Both the Greenbelt Marriott and the Holiday Inn have blocks under "SPARC". Both offer shuttle service to the NCWCP. A block of rooms are not reserved at these hotels, but rooms should be less than $100/night, no shuttle service, 10 minute drive or 30-40 min walk to NCWCP. Shuttles will be provided by Marriott and Holiday Inn each morning and evening. Workshop Dinners are being planned for Tuesday and Thursday evenings. Box lunches will be available during the workshops. A variety of lunch choices will be available. Lunch orders will be taken prior to each day's meeting. The cost for box lunch and refreshments will be about $20/day. Payment can be made at registration. These will be interactive workshops. Both oral and poster presentations will be given.